Q: I understand that reducing lead-time will cut down on inventory and give you more elbow room in delivery due time to customers, but how do you reduce lead-time? A: We use the word lead-time in a general sense, but there are a number of categories in lead-time such as manufacturing lead-time, purchase leading time and supply lead-time. Here, however, I will explain the methods for reducing manufacturing lead-time. Manufacturing lead-time is the time from the beginning to the end of production. At the bottom of the diagram, the units of manufacturing time are defined as n seconds and m seconds and net manufacturing time is allocated to actual resources (equipment and personnel). Sequentially allocating actual manufacturing time in this way from order delivery time from final process provides optimum insert timing. This is not a calculation by day units but by minute and second units. This method of calculation is called backward scheduling because it goes back from the last process to the first process. We can see that in the case shown in the diagram lead-time has been reduced by about 60 percent. An allocation of work like this may run into work for other orders. The scheduling method that solves the problem of jobs running into each other is known as theory of constraints scheduling. 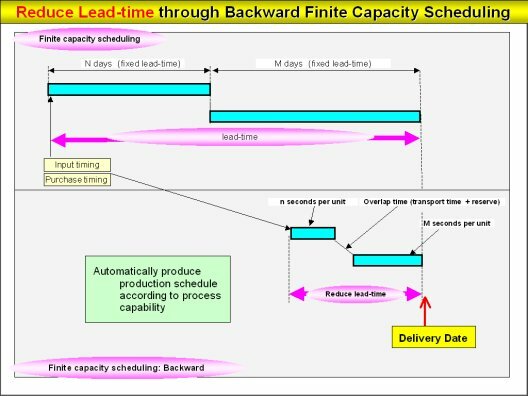 Theory of constraints scheduling material load provides optimum input timing that takes material load into consideration and greatly reduces lead-time.